Book now for astronomy classes running throughout the year! All issues of Look Up! Stargazing is much more fun with HantsAstro. More Sky, Less rules. Astronomy has changed a lot from when we started the group in 2008. Not just with the advances in the technology we use, but how we combat the wetter winters, and milder summer we are now getting. Global warming or not, this makes getting the most out of your astronomy in the UK a real challenge. You may have all the gear, but get to use it is getting harder. We've been preaching the use of smaller (or elemental), more dynamic setups for observing or imaging. While aperture talks, setting up still takes time. Simple Dobsonians prove their worth, and our house 10" Dob aptly christened 'Rebel', demonstrates the quick set up with a great view. Imaging with a 70mm refractor, on a small tracking mount or tuned HEQ5 EQ mount using a DSLR, can offer stunning images. There's many ways to get what you want from astronomy, and having fun dodging the clouds to boot. Our 2016 Astronomy Classes that we run from Petersfield Community Centre still attracting much interest and bookings due to popular request mean that we can now offer a crash 2 part course in one day! Start in the morning with and intro to all the gear and what to buy and what works and what doesn't, moving ingto Part 1 in ther afternoon. In theory (and practice), you could be up and imaging that night with little or no knowledge of astro-imaging! We now run two Summerlands StarCamps for our members every year, both in May and September. As the Group has grown, more members are moving from tents, to caravans and motor homes, which permits some events in much colder weather. This is something we will be running as a pilot event this coming season. The StarCamps, get booked out with 60-70 astronomers, and we believe there is room for at least another event and venue. If you have any ideas, then we'd be happy to know more. As always, your first visit is free to Butser Farm and for only £18 for an Annual Pass you'll find out yourself why HantsAstro has become so popular. Groups are about people, not rules, and we have a great bunch people from all walks of life. Pop on to facebook and check us out on there. 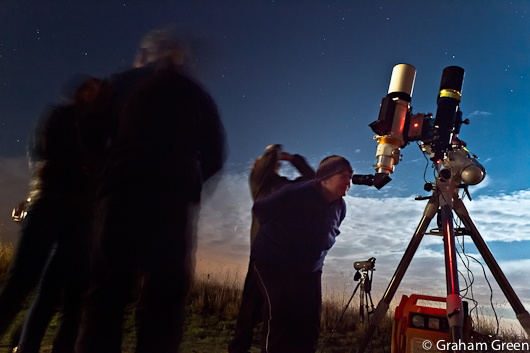 Hampshire Astronomy really does shine brighter with HantsAstro! More information can be found in Look Up!, where there are more details on our plans and progress. Registration is free (and easy...)To join HantsAstro, just download our simple PDF membership application form, save it to your PC, fill in the form on-screen, save and e-mail it back to membership@hantsastro.org. Or print it off, write and pop it in the post. Why not join HantsAstro today? The form requires Adobe Acrobat Reader 8.0 or above, download for free.